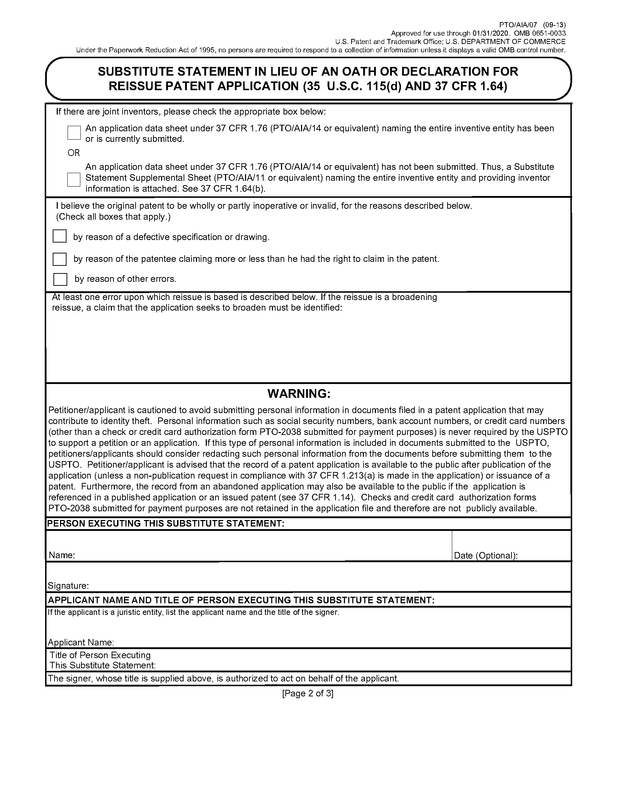 37 CFR 1.64 Substitute statement in lieu of an oath or declaration. (a) An applicant under § 1.43, 1.45 or 1.46 may execute a substitute statement in lieu of an oath or declaration under § 1.63 if the inventor is deceased, is under a legal incapacity, has refused to execute the oath or declaration under § 1.63, or cannot be found or reached after diligent effort. (ii) The last known mailing address where the inventor customarily receives mail, and last known residence, if an inventor lives at a location which is different from where the inventor customarily receives mail, for each inventor who is not deceased or under a legal incapacity. 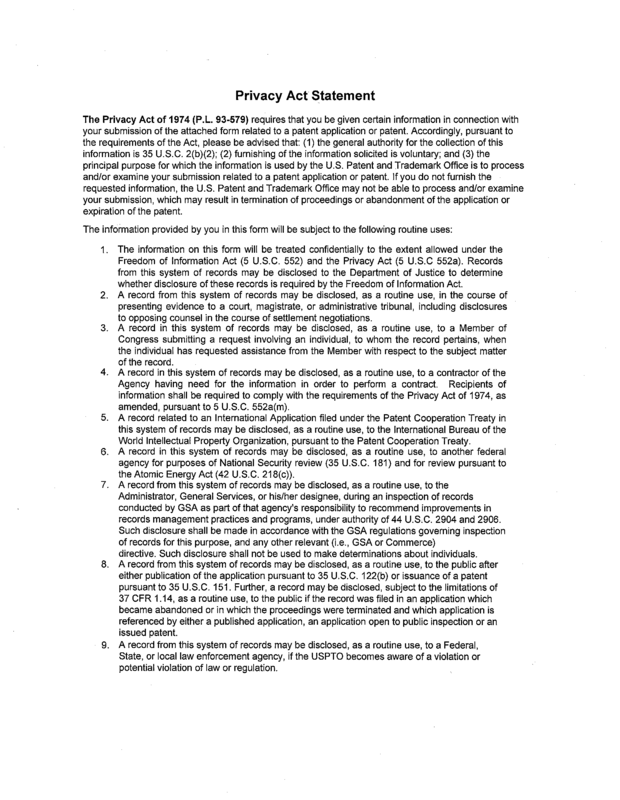 (c) A person may not execute a substitute statement provided for in this section for an application unless that person has reviewed and understands the contents of the application, including the claims, and is aware of the duty to disclose to the Office all information known to the person to be material to patentability as defined in § 1.56. (d) Any reference to an inventor's oath or declaration includes a substitute statement provided for in this section. (e) A substitute statement under this section must contain an acknowledgment that any willful false statement made in such statement is punishable under section 1001 of title 18 by fine or imprisonment of not more than 5 years, or both. (f) A nonsigning inventor or legal representative may subsequently join in the application by submitting an oath or declaration under § 1.63. The submission of an oath or declaration by a nonsigning inventor or legal representative in an application filed under § 1.43, 1.45 or 1.46 will not permit the nonsigning inventor or legal representative to revoke or grant a power of attorney. 37 CFR 1.64 implements the substitute statement provisions of 35 U.S.C. 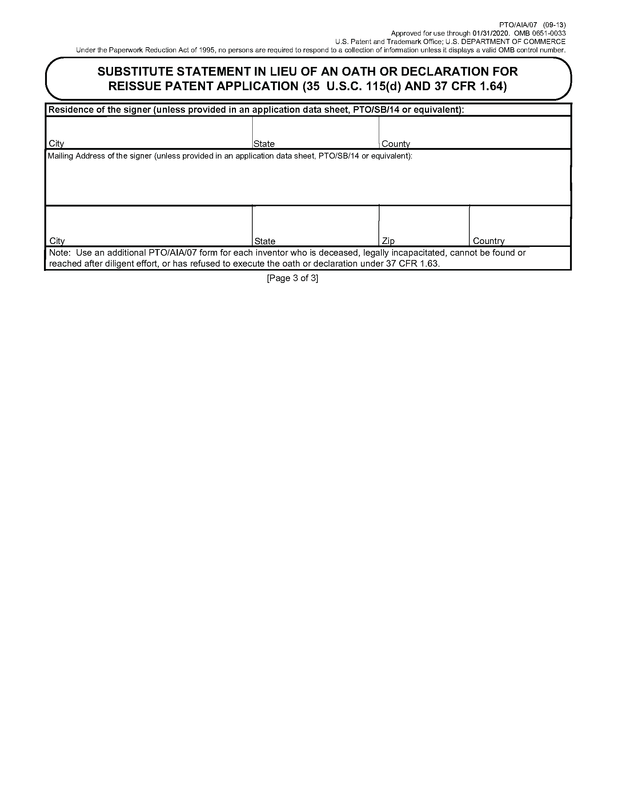 115(d) and applies to applications filed on or after September 16, 2012. 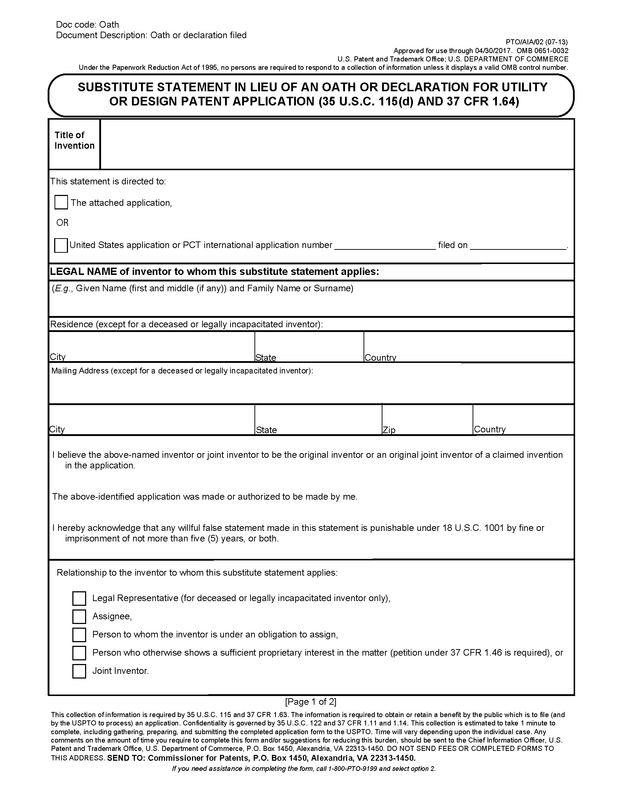 (iv) an applicant under 37 CFR 1.46 who is a party who otherwise shows a sufficient proprietary interest in the claimed invention under 37 CFR 1.46(b), where the inventor is deceased, legally incapacitated, refuses to sign the declaration or cannot be reached or located after diligent effort. 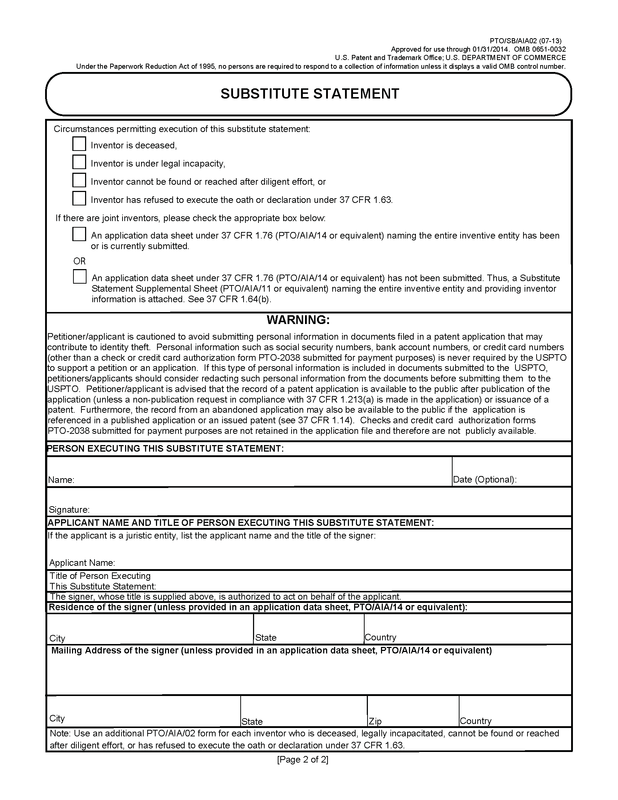 A non-inventor applicant need not submit proof of the permitted circumstance to file a substitute statement (e.g., inventor’s death certificate to establish that a named inventor is deceased). 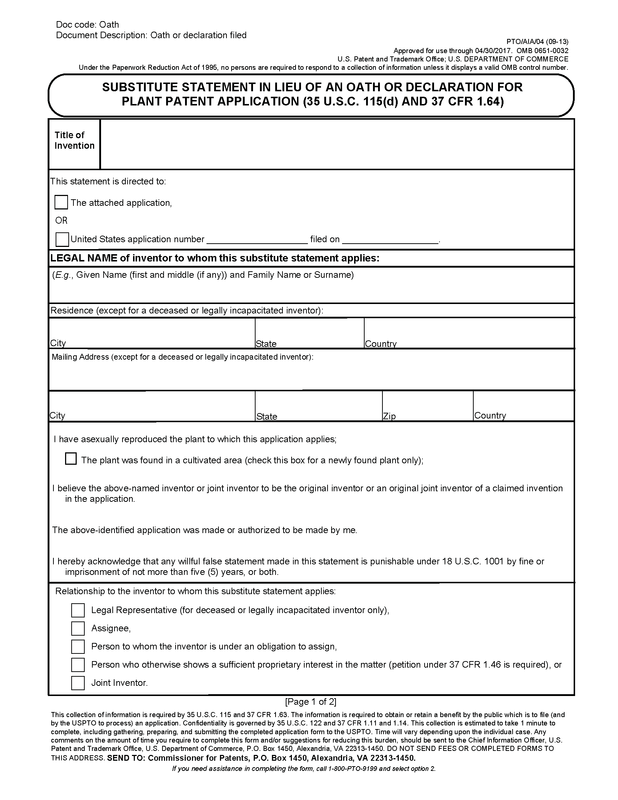 However, where the permitted circumstance identified in accordance with 37 CFR 1.64(b)(3) is other than the inventor’s death or legal incapacity, the inventor must have refused to execute the oath or declaration, or applicant must have exercised diligent effort to find or reach the inventor. Though proof is not required to be submitted to the Office, proof of attempts to secure the inventor’s signature should be kept in applicant’s file. There is no change to what is considered a good faith attempt to contact an inventor and what constitutes a refusal to sign. A substitute statement under 37 CFR 1.64 must: (1) comply with the requirements of 37 CFR 1.63(a), identifying the inventor or joint inventor with respect to whom a substitute statement in lieu of an oath or declaration is executed, and stating upon information and belief the facts which such inventor is required to state; (2) identify the person executing the substitute statement and the relationship of such person to the inventor or joint inventor with respect to whom the substitute statement is executed, and unless such information is supplied in an application data sheet in accordance with 37 CFR 1.76, the residence and mailing address of the person signing the substitute statement; and (3) identify the circumstances permitting the person to execute the substitute statement, namely whether the inventor is deceased, is under a legal incapacity, cannot be found or reached after a diligent effort was made, or has refused to execute the oath or declaration under 37 CFR 1.63. 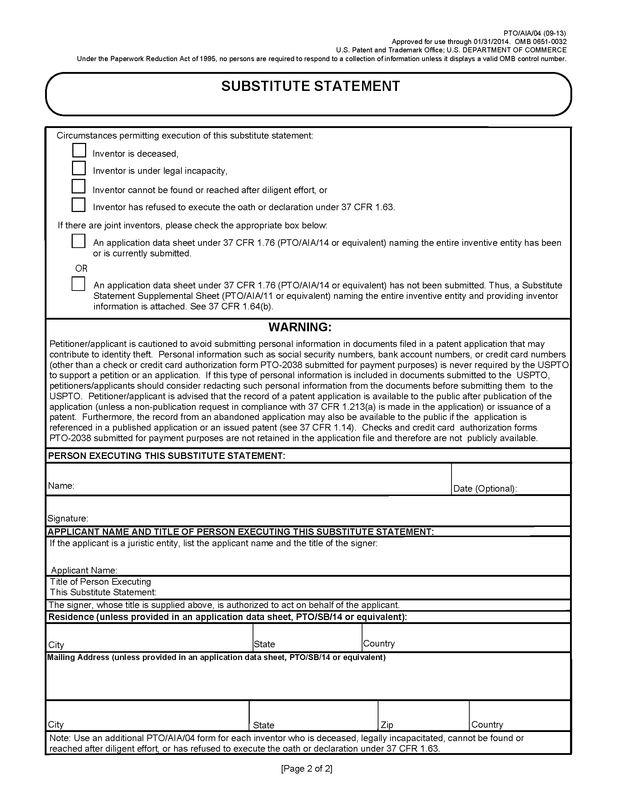 For nonprovisional international design applications, the requirement in 37 CFR 1.64(b)(2) to identify the residence and mailing address of the person signing the substitute statement will be considered satisfied by the presentation of such information in the international design application prior to international registration. See 37 CFR 1.1021(d)(3). Where an assignee executes a substitute statement, the assignee must supply his/her residence and mailing address. If the assignee is a juristic entity, the residence and mailing address of the juristic entity should be used. Additionally, if the assignee is a juristic entity, the applicant name and the title of the person executing the substitute statement must be included. 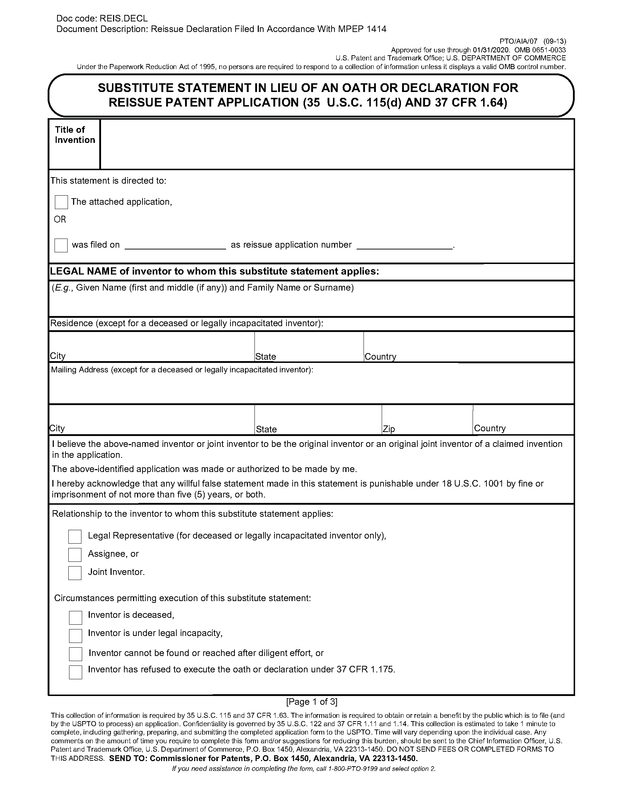 In addition, unless such information is supplied in an application data sheet in accordance with 37 CFR 1.76, or in an international design application prior to registration (see 37 CFR 1.1021(d)(3)), the substitute statement must also identify: (1) each inventor by his or her legal name; and (2) the last known mailing address where the inventor customarily receives mail, and last known residence, if an inventor lives at a location which is different from where the inventor customarily receives mail, for each inventor who is not deceased or under a legal incapacity. A non-inventor applicant is not required to state in the substitute statement that he/she has reviewed and understands the contents of the application, including the claims. 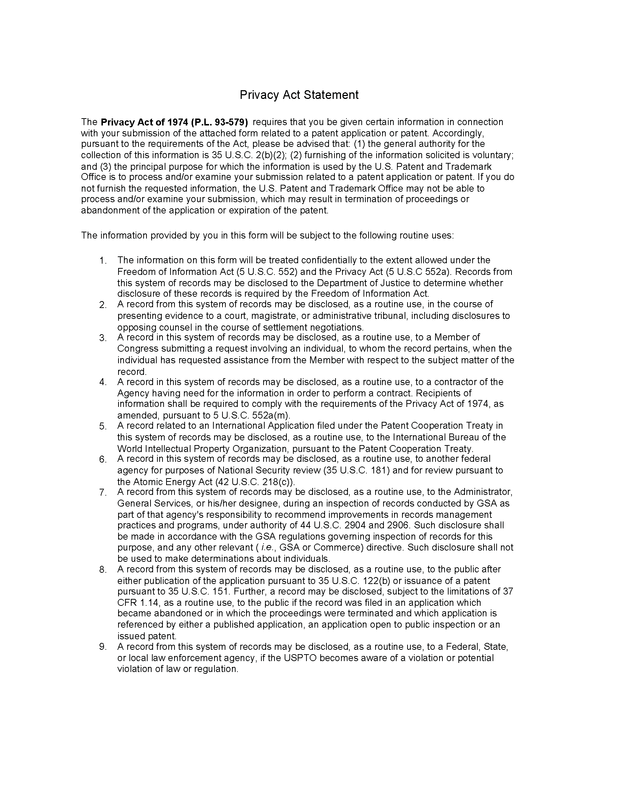 Nevertheless, it should be noted that a person may not execute a substitute statement under 37 CFR 1.64 unless that person has reviewed and understands the contents of the application, including the claims, and is aware of the duty to disclose to the Office all information known to the person to be material to patentability as defined in 37 CFR 1.56. See 37 CFR 1.64(c). Any reference to an inventor’s oath or declaration also includes a substitute statement as provided for in 37 CFR 1.64. A substitute statement under 37 CFR 1.64 must contain an acknowledgement that any willful false statement made in such statement is punishable under 18 U.S.C. 1001 by fine or imprisonment of not more than five (5) years, or both. A nonsigning inventor may subsequently join in the application by submitting an oath or declaration under 37 CFR 1.63.